The material in this collection is based mostly upon my personal choice. These three discs encompass the creative periods in Stephen Sondheim’s professional life, although within a given disc there is not necessarily an effort to be strictly chronological. Each disc has been programmed for what I hope will prove to be an attractive and entertaining flow of material. As a collector myself, somewhat steeped in Sondheim’s works, it is difficult to avoid being a little didactic in this presentation. If there are too many moral or instructive lessons herein, I apologize, and I will try to explain my rationale behind some of the choices. The album begins not with one curtain-raiser but with two: the final and former openings of A Funny Thing Happened on the Way to the Forum. Thereby the tone of this collection is set almost immediately: this is a compendium of material, some less well-known because it was cut from a show before opening night, and some that is simply irresistibly appealing. Throughout the set are examples of songs that did not function properly within the dramatic context of a show but that – when devoid of other contexts – stand apart as brilliant and beautiful or as expressions of character or as just gratuitous pieces of lyricism to be appreciated on their own terms. This is also a collection that includes recorded material that has not been released before, e.g., “It’s a Hit!” from Merrily We Roll Along and Lee Remick’s “There Won’t Be Trumpets.” And I couldn’t resist the three finales of Company in a row. Perhaps only one worked in the show, but they all work here. Some material is here only because I love it; the English cast versions of “A Weekend in the Country” and “The Miller’s Son,” the Angela Lansbury (plus Sondheim) performances of “Send In the Clowns,” “Someone in a Tree,” and others. But then my need to “demonstrate” re-emerges, and so I have included several sexually suggestive (never explicit) songs like “Marcus Lycus,” “Liaisons,” and “I Never Do Anything Twice.” I also felt the urge (speaking of “Liaisons”) to point up, along with “Children and Art,” Sondheim’s several treatments of old women who combine the wisdom of a lifetime’s experience with the inevitable frailties of old age. Sondheim’s lyric and dramatic points arise from a musical theater written for adults. Situations are motivated from experiences and emotions indigenous to an intelligent, passionate, and romantic cast of characters. His ingenues are rather arch and acerbic behind their surface sweetness – Anne, for example, in “Weekend.” His heroes – soldiers particularly – can be very brave and very stupid: Carl-Magnus, who turns love into war (“Bang”), and Miles Gloriosus, who makes war out of love (“Something About a War”). Characters often contradict themselves: they say one thing (which they may in fact momentarily believe) but perhaps mean something quite different. Does Fredericka really believe that she is happier because of an absentee mother? Does Ben love Sally? Did Ben ever love Sally? With Follies we display Sondheim’s homage by imitation. “You’re Gonna Love Tomorrow” and “Love Will See Us Through” are affectionate tributes to Jerome Kern and Burton Lane with Ira Gershwin and E.Y. Harburg. “Losing My Mind” salutes George Gershwin and Dorothy Fields. In Pacific Overtures, “Please Hello” parodies the essence of Gilbert and Sullivan, Sousa, Offenbach, and any number of anonymous Russian composers. Yet another theme seems irresistible and pervasive: the apparent richness and passion of the past contrasted with the bleakness or crassness of the present. This theme appears to be seminal to Sondheim’s choices of subject matter: it informs Evening Primrose, Follies, A Little Night Music, Pacific Overtures, Sweeney Todd, Merrily We Roll Along, and, most recently and poignantly, Sunday in the Park with George. Speaking again of “follies,” one of mine was engendering the disco version of “The Ballad of Sweeney Todd.” I have never yet met anyone who would willingly dance to it, and it was a commercial disaster. But since I doubt that many people will dance their way through this album, here it is, slightly truncated for one’s listening pleasure. The last few selections may, in their juxtaposition, provide the listener with a flow of songs pointing up the essence of Sondheim as creator: the lyrical beauty of “Our Time” almost segueing into a seriously arpeggiated “Children and Art” (as personal and touching a piece of material as I can imagine), followed by “Move On” and ending with Sondheim himself expressing his camaraderie and sense of continuity with friends and colleagues who came to participate with him at a special concert [at the Whitney Museum] in his honor. 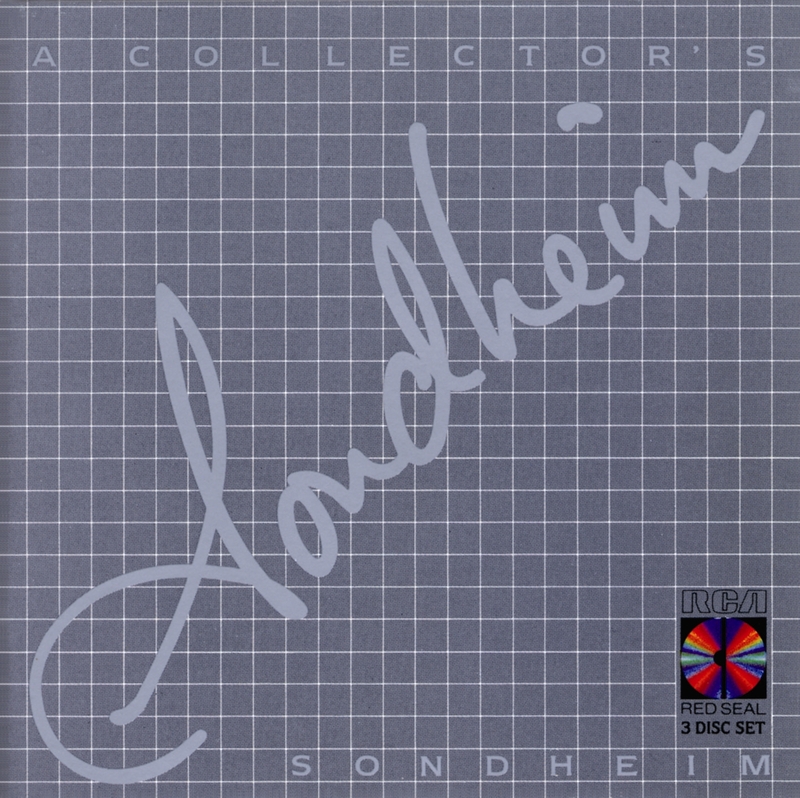 This important 3-CD set, originally released in 1986, brought together many of the highlights in Sondheim’s career up to that time in a retrospective that included many firsts. While superseded by most recent compilations, it is still a vibrant homage to the Broadway composer that should be in every collection.